Patterns > Bags, Bins, Purses, & Totes > Contain Yourself - Organize and store all sorts of items in these soft-sided fabric bins. 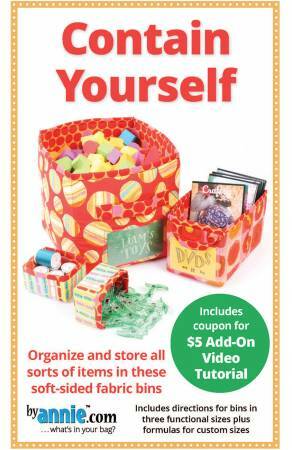 Contain Yourself - Organize and store all sorts of items in these soft-sided fabric bins. The pattern includes complete instructions for containers in three fun sizes with optional labels and handles. Each size is designed to coordinate well with standard sized cube shelves, allowing you to not only become more organized, but to also decorate your room. Once you’ve mastered the technique, design your own bins of any size using the handy formulas and tips included in the pattern. You’ll love having custom containers for all your storage needs! NOTE: Depending on the size of bin that you design, additional fabric, Soft and Stable, interfacing, and vinyl may be required. See pattern for details.